Wes Carr, President at PEC Premier Safety Management, and CBC President Dr. Beatriz T. Espinoza sign an agreement to offer OPPS training on the CBC Pleasanton campus. 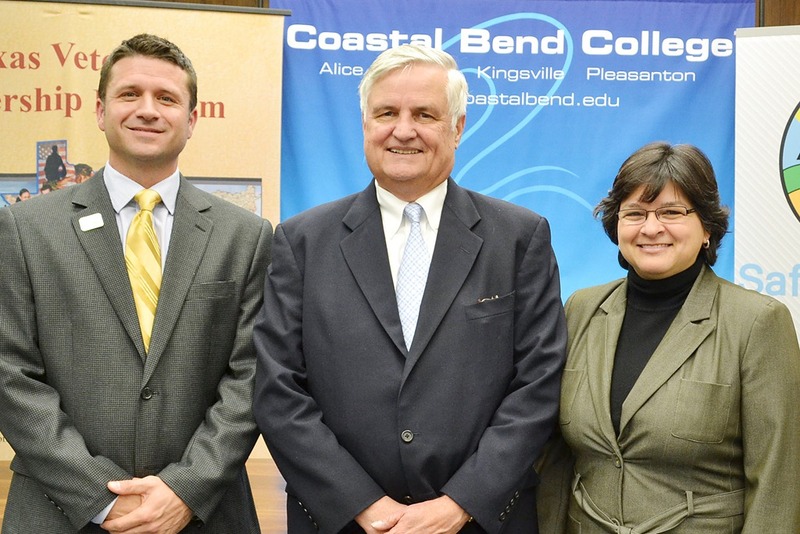 Representatives from Coastal Bend College, Petroleum Education Council (PEC) Premier, Texas Workforce Commission, and the Texas Veteran’s Leadership Program gathered on the CBC Beeville campus for a signing ceremony on December 6, 2012. Wes Carr, President at PEC Premier Safety Management, and CBC President Dr. Beatriz T. Espinoza signed an agreement to offer 5-day Oil Patch Preparation Systems (OPPS) training courses on the CBC Pleasanton campus. “There are two main points to OPPS training—one is to help standardize safety training to meet industry demands. The other is to help people get home safely, and this partnership with CBC allows us to do both,” said Carr. The OPPS Project is a 5-day entry level training and job placement program that is designed to help students gain the skills needed to get started in oil and gas safety related occupations. Students in the OPPS Project will receive hands-on training in addition to classroom instruction, and the training credential is transferrable. Upon successful completion of the training, the students will receive a hardhat, steel toe rubber boots, gloves, safety glasses, and ear protection to help them get to work in oil and gas safety occupations. Currently, over 300,000 people have taken the OPPS training course. Tom Pauken, the Commissioner Representing Employers for the Texas Workforce Commission, spoke at the signing ceremony about how critical it is to offer training programs like these in order to keep employees safe and help put young veterans to work—quickly. “In Texas, we’re seeing a shift towards more workforce training and education. We should offer more support for our community colleges because they move quickly and help create more training opportunities for jobs, especially for veterans. I thank Coastal Bend College and Dr. Espinoza for doing their part,” Pauken said. Coastal Bend College is proud to offer the OPPS Project to help meet local workforce demands, and help educate all participants about the important of safety in oil and gas related industries. The OPPS Project is scheduled to begin February 2013 at the CBC Pleasanton campus. To register for the program or to find out more information, please contact Lillian Garza at (361) 354-2331 or Nora Cartwright at (361) 354-2230. From left to right, Wes Carr, Commissioner Tom Pauken, and Dr. Beatriz T. Espinoza partner together to help educate South Texas’ workforce about the importance of safety.